To get a better handle on search engine optimization, it’s important to understand why people use search engines, at all. Generally, people use search engines for one of three things: research, shopping, or entertainment. Someone may be doing research for restoring their classic car. Or looking for a place that sells parts for classic cars. Or just looking to kill time with video that shows custom cars racing. Most people who are using a search engine are doing it for research purposes. They are generally looking for answers or at least to data with which to make a decision. They’re looking to find a site to fulfill a specific purpose. Someone doing a term paper on classic cars for their Automotive History 101 class would use it to find statistics on the number of cars sold in the United States, instructions for restoring and customizing old cars, and possibly communities of classic car fanatics out there. Companies would use it in order to find where their clients are, and who their competition is. Search engines are naturally drawn to research-oriented sites and usually consider them more relevant than shopping-oriented sites, which is why, a lot of the time, the highest listing for the average query is a Wikipedia page. Wikipedia is an open-source online reference site that has a lot of searchable information, tightly cross-linked with millions of back links. Wikipedia is practically guaranteed to have a high listing on the strength of its site architecture alone. Wikipedia is an open-source project, thus information should be taken with a grain of salt as there is no guarantee of accuracy. This brings you to an important lesson of search engines — they base “authority” on perceived expertise. Accuracy of information is not one of their criteria: Notability is. A smaller percentage of people, but still very many, use a search engine in order to shop. After the research cycle is over, search queries change to terms that reflect a buying mindset. Terms like “best price” and “free shipping” signal a searcher in need of a point of purchase. Optimizing a page to meet the needs of that type of visitor results in higher conversions for your site. Global search engines such as Google tend to reward research oriented sites, so your pages have to strike a balance between sales-oriented terms and research-oriented terms. This is where specialized engines come into the picture. Although you can use a regular search engine to find what it is you’re shopping for, some people find it more efficient to use a search engine geared directly towards buying products. Some Web sites out there are actually search engines just for shopping. Amazon, eBay, and Shopping.com are all examples of shopping-only engines. The mainstream engines have their own shopping products such as Google Product Search (formerly called Froogle) and Yahoo! Shopping, where you type in the search term for the particular item you are looking for and the engines return the actual item listed in the results instead of the Web site where the item is sold. For example, say you’re buying a book on Amazon.com. You type the title into the search bar, and it returns a page of results. Now, you also have the option of either buying it directly from Amazon, or, if you’re on a budget, you can click over to the used book section. Booksellers provide Amazon.com with a list of their used stock and Amazon handles all of the purchasing, shipping, and ordering info. The same is true of Yahoo! Shopping and Google Product Search. And like all things with the Internet, odds are that somebody, somewhere, has exactly what you’re looking for. The following figure displays a results page from Google Product Search. 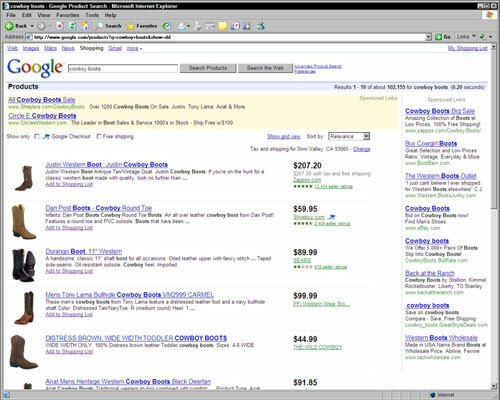 A typical Google Product Search results page. Research and shopping aren’t the only reasons to visit a search engine. The Internet is a vast, addictive, reliable resource for consuming your entire afternoon, and there are users out there who use the search engines as a means of entertaining themselves. They look up things like videos, movie trailers, games, and social networking sites. Technically, it’s also research, but it’s research used strictly for entertainment purposes. A child of the 80s might want to download an old-school version of the Oregon Trail video game onto her computer so she can recall the heady days of third grade. It’s a quest made easy with a quick search on Google. Or if you want to find out what those wacky young Hollywood starlets are up to, you can turn to a search engine to bring you what you need. If you’re looking for a video, odds are it’s going to be something from YouTube, much like your research results are going to come up with a Wikipedia page. YouTube is another excellent example that achieves a high listing on results pages. They’re an immensely popular video-sharing Web site where anyone with a camera and a working e-mail address can upload videos of themselves doing just about anything from talking about their day to shaving their cats. But the videos themselves have keyword-rich listings in order to be easily located, plus they have an option that also displays other videos. Many major companies have jumped on the YouTube bandwagon, creating their own channels (a YouTube channel is a specific account). Record companies use channels to promote bands, and production companies use them to unleash the official trailer for their upcoming movie.